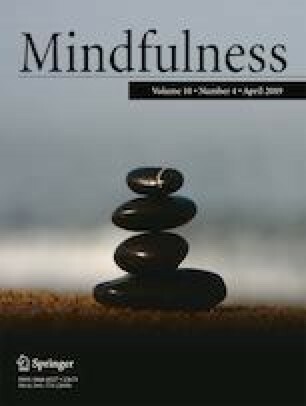 The topic modelling process obtained a panoptic view of mindfulness research, providing mindfulness researchers with some indicators regarding the range of topics researched. The outcome of this topic modelling effort has been made available at https://hdl.handle.net/10497/20862. Present moment Scoping study Modelling Mapping Research trend. We like to thank Clarivate Analytics for Web of Science Core Collection data access. We would also like to thank research assistants for their help with preparing the reference lists for identified topics. YHK conceptualised the study, completed the data analysis involving R programming, led the interpretation of Collective Themes and Suggested Terms, wrote the paper and formatted the TiddlyWiki file. CL wrote part of the methods and discussion sections, interpreted the Collective Themes and Suggested Terms and formatted the TiddlyWiki file. LCK wrote part of the discussion section, interpreted the Collective Themes and Suggested Terms and formatted the TiddlyWiki file. CJT wrote part of the introduction section and interpreted the Collective Themes and Suggested Terms. KC analysed the data and prepared the figures depicting the beta cutoff. All authors approved the final version of the manuscript for submission. To determine the optimal number of topics within the document term matrix, the optimal_k function (available on https://github.com/trinker) was used. This function produces multiple LDA models iteratively (parameters: seed = 5412, burnin = 1000, thin = 100, iter = 1000, keep = 100) and plots the harmonic means of the log likelihoods from each topic. We set an upper limit of 200 topics and ran the simulations. The entire process took approximately 11 h on a laptop with the following configuration: Windows 7 Enterprise Intel® Core™ i7-4510 U CPU at 2 GHz, 2.6 GHz with 8 GB RAM and 64-bit operating system. Since the value depicting the maximisation of the harmonic mean of the log-likelihood was 106, we set the optimal number of topics as 106. Once the optimal number of topics was determined, we generated the final LDA model on the document term matrix using the lda function in topicmodels (Grün and Hornik 2011) based on k = 106 and the aforementioned parameters. Within the final model of 106 topics, each topic was assigned an arbitrary topic number (e.g. Topic 1), and with each topic, a list of generated terms together with the terms’ respective beta values were derived. Briefly, beta is indicative of the probability of occurrence of a term within a topic, or per-topic-per-word probabilities (Silge and Robinson 2017). For example, if a generated term “sport” has a beta of 0.30 for Topic N, it means that the probability of “sport” being generated from Topic N is 30%. Within a topic, say sport, one may find that a closely related word for that topic, for example, “athletics,” may have a higher beta then a relatively unrelated word like “headsets.” Since all the generated terms are assigned to each topic but with varying betas, to derive a meaningful list of terms for each topic, we calculated a cutoff value for beta to omit terms with substantially lower betas, using the Fisher method, implemented with the classIntervals function in classInt (Bivand 2017). A list of more relevant generated terms for each topic which are surfaced for subsequent interpretation as a result (e.g. flow, coach, athlete and sport), after dropping the remaining terms with betas lower than the cutoff value (e.g. neighbourhood and fund). In some cases, there is only one term as the beta values for the second term onwards are below the cutoff value. We further rely on the gamma values to generate lists of publications that best represent contents tied to each topic number. Briefly, the gamma value is an estimation of the proportion of words from a particular publication record that is generated from a specified topic, or per-document-per-topic probabilities (Silge and Robinson 2017). For example, if record A has a gamma of 0.90 for Topic X whilst record B has a gamma of 0.01 for Topic X, Topic X is better represented by record A than record B, comparatively. The result is that all the records will have a gamma value for a target topic. With that, a cutoff value, derived using the aforementioned Fisher method, was applied to derive the list of records with substantially greater gammas to further interpret the topic. Bishop, S. R., Lau, M., Shapiro, S., Carlson, L., Anderson, N. D., Carmody, J., et al. (2004). Mindfulness: a proposed operational definition. Clinical Psychology: Science and Practice, 11(3), 230–241. https://doi.org/10.1093/clipsy.bph077. Feinerer, I., & Hornik, K. (2017). tm: Text mining package. R package version 0.7-1. Retrieved from https://CRAN.R-project.org/package=tm. Feinerer, I., Hornik, K., & Meyer, D. (2008). Text mining infrastructure in R. Journal of Statistical Software, 25(5), 1–54. https://doi.org/10.18637/jss.v025.i05. Graham, T., & Ackland, R. (2015). Topic modeling of tweets in R: a tutorial and methodology. Retrieved from https://www.academia.edu/19255535/. Accessed 30 Oct 2017. Lyzwinski, L. N., Caffery, L., Bambling, M., & Edirippulige, S. (2017). A systematic review of electronic mindfulness-based therapeutic interventions for weight, weight-related behaviors, and psychological stress. Telemedicine Journal and e-Health. https://doi.org/10.1089/tmj.2017.0117. Rinker, T. (2015, December 24). optimal_k.R Retrieved October 20, 2017 from https://github.com/trinker/topicmodels_learning/blob/master/functions/optimal_k.R. Ruston, J. (n.d.). TiddlyWiki5. Retrieved from https://github.com/Jermolene/TiddlyWiki5.